Basketball has officially started, and whether you’re a sports enthusiast, or apathetic to hoops, you’re likely interested in the social stats. Today we are going to pit the Western Conference vs the Eastern conference. Which teams have the greatest Facebook presence? Who engages their fans the most? The LA Lakers, by a huge margin, have the greatest number of fans compared to other teams in their conference. At a stunning 21 million fans, the Lakers dwarf the runner-up San Antonio Spurs, who have 5.104 million fans, and the Oklahoma City Thunder, who trail at 5.103 million fans. 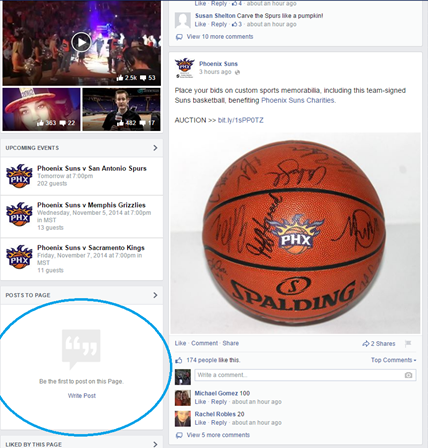 Despite leading in fans by a wide margin, the Lakers have opted to disable user comments on their Facebook page. Disabling user comments creates disconnect from the audience and reduces engagement. To play the devil’s advocate, a fan may decide they want to vent about an issue on the Laker’s page. Instead of having the option to create a post, where it likely won’t be seen by many people, they may choose to respond to a Laker’s post, which will increase visibility of their comments. Conversely, the Phoenix Suns, who have the highest amount of user posts, seemingly delete all user posts after they’ve gone up. Aside from keeping their social media manager employed, this likely also will create organic reach to non-fans, which, in theory, could lead to fan growth. Through the month of October, the Lakers have held 5 of the Top 10 Posts by Likes through the Western Conference, followed by 3 Posts from the San Antonio Spurs, 1 from the Golden State Warriors, and 1 from the Houston Rockets. Unable to defend their top spot, it seems Lakers fans are not as apt to comment on statuses as Spurs or Suns fans. Overall, the Lakers win the engagement war for Western Division. Being a highly successful team (and having Kobe Bryant) has its advantages in social, though there is always room for improvement. How about the Eastern Conference? The Chicago Bulls have 16.4 million fans compared to the Miami Heat’s 15.7m fans. Combined, the Eastern Conference teams have a total of 63,043,881 fans, compared to the 53,200,775 fans of the Western conference. Like the Lakers, the Chicago Bulls, Miami Heat and a few other teams have opted to remove user posts as well. It would appear that there may be a tipping point between a certain amount of Facebook fans, and allowing these fans to post. Of the Top 10 Posts by Likes, the Cleveland Cavaliers take the top spot with a post featuring LeBron James and Kyrie Irving. LeBron recently went back to the Cavaliers after a stint with the Miami Heat, so this likely created some buzz. The Miami Heat hold 3 of the most liked posts, and 7 spots on the Top 10 Posts by Comments. Most comments from both the Heat and Cavaliers pertain to LeBron James. If I was the social media manager at the Cavaliers, I’d start running some fan growth ads. The Miami Heat win round. NBA teams are consistently posting great content, and fans are liking, commenting and sharing which leads to some great organic growth. NBA teams should take this one step further and actively engage their fans in conversation or respond to complaints. Show that your team is more than pictures of uniforms. Less popular teams can expand upon their fan base by running fan growth ads, promoting their posts (especially after a winning game), and generating team spirit. Go the extra mile with your fans and don’t be surprised if they’ll start turning up to home games wearing their favorite player’s jersey. Contact us for your social dashboard demo!